I’m relatively new to comic book reading because of the scarcity of comic book stores here in the Philippines, but I got an opportunity to read this because I knew someone who had a copy and shared it with me. I really like this comic book because I always wondered how Batman started out. I mean, I knew how movie-wise, but really reading them on the actual comics they were based on is a whole other experience. There is also an animated movie of the same name released just this year. I haven’t watched it yet, but I heard it is faithful to the comic book. You’ll find in Batman: Year One Batman at the infancy of his planning stage. Eighteen years after his parents’ death, the business empire heir thinks that he is now ready to “clean up a city that likes being dirty”, the infamous Gotham City. The city really needed a hero at this time since it was wrought with crime and danger everywhere. This book also chronicles the life of Lieutenant Gordon, a detective, after his arrival to Gotham City and his interactions with the Dark Knight. (view spoiler). I really liked the story since it provides a good, solid background for people who want to know more about Batman. This is the first comic book I’ve read that was written by Frank Miller, and I can’t wait to read more. As I advanced through the pages, I couldn’t help but admire the graphics as well. I mean, it’s a comic book! I love the old-school feel of David Mazzucchelli’s illustrations, reminiscent of the superhero comic strips in the comic sections of newspapers that I religiously followed as a child. 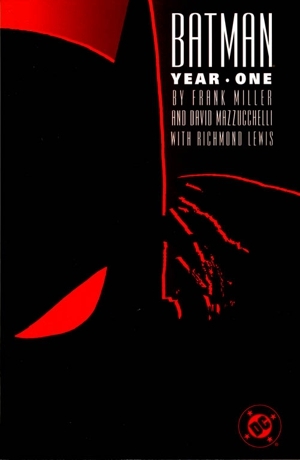 Even if it’s more than two decades old, this book is a must-read for everyone, not just DC or Batman fans. It’s easy to follow for new comic book readers, and if I’m not mistaken, I think this comes first if the Batman comics were to be read chronologically. I’m seriously considering buying the physical version of this book, not the digital comics, and hopefully the 4 issues instead of the compilation. I don’t think it will come cheap though. Then again, for such a brilliant series, it deserves it. Let’s support the comics industry! Not much people buy anymore, and it would be a shame if the industry died out.